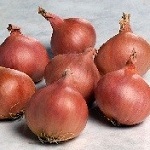 Long French type of shallot with yellow skin. Sow February-March to harvest late August-Sept.
High yielding globes of deep red colour. Sow February to April indoors, April outdoors.